There's some food combinations out there that should be pretty obvious to put together. For instance, for a mac 'n cheese cookoff this past weekend to benefit a neighborhood race, I may have invented one: exploded pierogi mac. I mean, think about it: there's two main common ingredients, namely cheese and dough/noodle. There's no recipe out there, far as I can find, though, so I just pulled one out of an impolite place to mention on this here blog. So here's what I did - homemade pierogi dough cut up to bite-sized noodle bits, then boiled and fried (talk about a PITA process), bacon, onions, and a potatoey cheese sauce with a good dose of seasoning to top it all off, and baked for a while. Darn good stuff, if a bit indulgent. But good enough to win the People's Choice vote and some folks even wanted to take my picture - kinda weird, and not quite my fifteen minutes of fame, but it was a good solid five, at least. If so inclined you can read more about the event here with a new food blogger buddy I met at the event, Breelicious Bites. Other combinations: not as obvious. Like coffee and garlic. Cheese and chocolate. 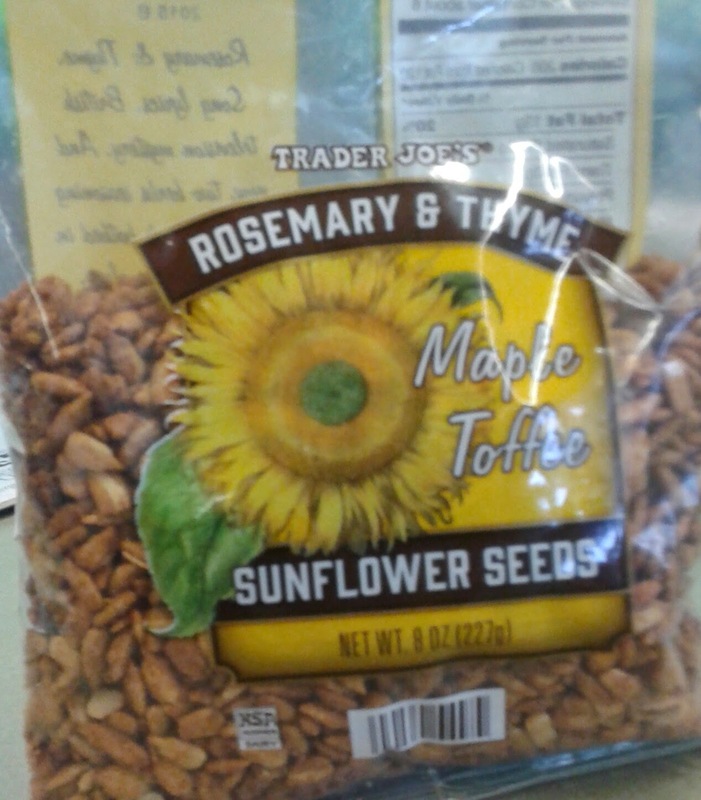 Or these new-fangled snackers I discovered the other morning: Trader Joe's Rosemary & Thyme Maple Toffee Sunflower Seeds. Rosemary and thyme? Yes, that works. Maple and toffee? Absolutely. But all four? Well, well, well, that gets interesting, so let's get this as clear as we can by breaking it down. Maple syrup = basically sugar. Toffee = sugar + butter. And butter makes almost anything taste better, including a classic herbal pairing worthy of song and bad British TV. So really, we're talking a buttery rosemary and thyme concoction...only with lots of added sugar. It's kinda weird, and I'm not sure if I'm completely on board with it...but it sure is intriguing, I'll give it that. But it works. Kinda. Maybe. I think. Part of the fun of this particular product is each bite tastes a little different - some bites are more herbaceous, others lean much more towards the maple and sugar. There's always some of each flavor present, just in different ratios, and there doesn't seem to be a discernible pattern to which way the flavors hit - sometimes it's savory first then sweet, other times vice versa. Just depends. Plenty of salty butteriness regardless, so it's almost like there's a trifold of flavors continually jostling for attention, with each one winning on occasion. Everything else is remarkably tasty. Based on sheer texture, I could munch these for hours - the seeds are roasted thoroughly in the maple glaze to give them a light, airy, crispy snacky bite to each. And maybe by then I'd have an idea if these are actually, truly good, or just an intriguing oddity out there. I can't quite make my mind, and neither can the wifey, but as this point we'll grade them fairly positively. Also, the wifey wanted it to be mentioned that these would probably be a great addition to a salad - I can be on board with that. Now, what do you think? Comment away! It sounds good. Something different than standard seeds. BBQ,Ranch, Cheddar. Now something sweet added in. I grabbed these with excitement in the store yesterday, then read the ingredients. Went right back on the shelf. What did you see that you didn't like? For my two cents, I thought it was a pretty straightforward list given the product name. I tossed a few over roasted brussels sprouts and my whole family enjoyed the dish. I think they are pretty tasty on their own, but I don't eat dairy. I didn't read the label carefully--my bad.